Medieval News: What Toys did Byzantine Children Play With? A new book on Byzantine children is providing fascinating insights into how people viewed childhood and adolescence in the Middle Ages. 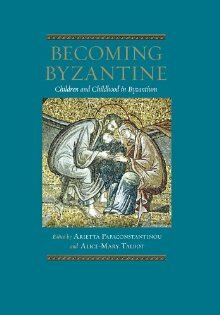 Becoming Byzantine: Children and Childhood in Byzantium, is a collection of nine articles that reveal various aspects of childhood, ranging from their legal status to how they were treated when they died. In her article, 'The Material Culture of Childhood in Byzantium,' Brigitte Pitarakis examines various physical objects associated with children, including clothes, food and toys. Pitarakis writes, "because toys were often presented to children as gifts, they served as an important mechanism of bonding between adults and children." According to Pitarakis' research, the first toy an infant might receive would be a rattle, often made of clay, with pebbles or grains inside the hollow container. They were also usually painted in bright colours. Once the child got a little older, his or her next toy would likely be a pull toy in the shape of horse on wheels or saddled with a rider. Another popular toy for kids were whistles, which were made of clay and often shaped like animals. Pitarakis also writes about how ball games were popular in Byzantium, both with children and adults. Byzantine writers describe some of the games played by children, both boys and girls, which would use balls, hoops, knucklebones and pebbles. The love of some of these games continued on into adulthood for many Byzantines - Emperor Michael VI, for example, ordered that one of his palaces be cleaned because he had lost a knucklebone he was playing with somewhere inside. Dolls were also important toy for Byzantine girls, and several examples of wooden and rag dolls have been found through archaeological investigations. Some dolls would come with clothes to dress them in, and at least one also used a strand real hair to serve as the doll's hair. Becoming Byzantine is published by Dumbarton Oaks Research Library, which is one of North America's leading research centers in Byzantine history.